Last week I introduced the multivariate breeders equation. Before moving on I want to talk a little about the types of traits that can be included in the selection vector. Of course it is logical enough to include morphological traits such as body size or leaf area. Only slightly more complicated are behavioral traits, and these are more complicated only because they are more difficult to quantify. But what about heritability? 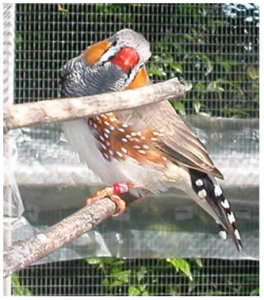 Nancy Burley (1988 Animal Behaviour 36: 1235-1237) found that female zebra finches in one population preferred males that had a red band placed on their leg. Clearly this is not heritable (leg bands were put there by a scientist!) and yet just as clearly there is a covariance between color of leg band and fitness (read mating success). Even though this is not heritable there is no reason, other than the obvious silliness of it, that it cannot be included as a trait in the selection analysis. This actually is something of an important point in that there are often times when selection analyses will be done on traits for which the heritability is unknown, or for which there are confounding environmental or developmental factors. A good example of this is the original paper describing measuring selection in natural populations, Arnold and Wade (1984. Evolution 38(4): 720-734). In this study they found that there was sexual selection for body size in frogs, with females preferring larger males. We know nothing about the heritability of body size, except that there is the confounding factor that older frogs are larger than smaller frogs. Thus, there are both environmental and developmental factors contributing to this trait; nevertheless, the selection analysis is perfectly valid, and this paper ends up being a landmark contribution to evolutionary biology. However, what I really want to talk about is when traits are not clearly attached to the individual. For example, if we can study selection on bird song dialects, can we study selection on deviation from the “mean” bird song dialect in a particular group (e.g., the rare-male advantage? Spiess 1968. Am. Nat. 363)? How about something even further removed from the individual, such as the population density, or the speed of the slowest member of the herd? It turns out that yes, these can be treated as if they were traits of the individual. The general approach is called contextual analysis. In a perfect world it would be so obvious that it wouldn’t have a name, but given biologists propensity to name things, and to dismiss that which they don’t understand, I am afraid a name is required. Contextual analysis was originally developed in the social sciences as a way of including social factors into an analysis of a persons opinions or behaviors. For example, whether or not a person votes, or goes to church, or owns a gun is strongly influenced by the social norms in their community. (I will save space by omitting examples. You can make up your own.). This general idea was brought into the realm of biology by Heisler and Damuth (1987. American Naturalist 130: 582-602.). Since then it has been roundly criticized by those who don’t bother to understand it (e.g., West et al. Journal of Evolutionary Biology 20: 415-432. ), and enthusiastically embraced by those who collect and analyze data (e.g., Eldakar, et al. 2010. Evolution 64: 3183-3189, Moorad 2013. Evolution 67: 1635-1648). Of course I am totally unbiased on this issue. . . The basic idea is that a selection analysis can include not only “individual” traits (e.g., leaf area), but also group or neighborhood summary traits (e.g., group mean leaf area), and contextual traits, that is traits that cannot be measured on an individual (e.g., population size). The crazy thing is that when you do this it works. In an older paper we sort of beat it to death theoretically, and it stood up to all challenges (Goodnight, C. J., et al. 1992. American Naturalist 140:743-761.). Bottom line is that contextual analysis works. It is no better or worse than the selection analysis championed by Arnold and Wade. I have come around to thinking about traits like population density as properties of the individual – that is, population density can be thought of as the population density that an individual experiences. If there is a classic group structure then all members of the same group will experience the same population density, however, in a viscous continuous population every individual is at the center of their own neighborhood and will experience slightly different population densities. Thus, in the neighborhood situation it is clear that “contextual” traits really are properties of the individual. The problem, of course, is that we really don’t know how to measure, or even how to define the heritability of contextual traits. In principle it is the regression of the population traits that an offspring experiences on the population traits the parents experience; however, standard genetic methods specifically randomize the social environment. Obviously protocols for measuring the heritability of contextual traits will not be simple modifications of standard breeding methods. Nevertheless, as pointed out at the beginning of this essay, even if we aren’t sure of the heritability of contextual traits, we can still use them in selection analyses. The point is that contextual analysis (CA) is really just the idea that you can include contextual traits in a selection analysis. As such it is not multiple regression per se. It could be used just as well in a path analysis (contextual path analysis? I like it) as was done by Stevens et al. (1995. American Naturalist 145: 513-526), as well as any of the various means of measuring selection that have been suggested over the years. I should deal with a few complaints about CA. One common one is that the traits we used in Goodnight Schwartz and Stevens are a nebulous trait and the group mean of that trait. This has led many to think you MUST use the group mean of the trait. The reality is that just as with any selection analysis choice of traits is important and nuanced. In our model we were dealing with theoretical infinitely sized groups, and the group mean of the trait made sense. In actual experimental situations it may make sense to leave out the focal individual in a jack-knifed group mean (note that in this case every individuals contextual trait will be slightly different). In other cases other summary measures may be appropriate. 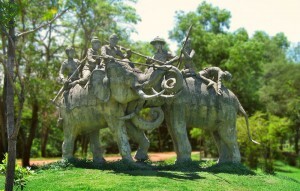 As an example, in humans single combat, or champion warfare, was used as a means of settling disputes. Each side would choose a champion and the two champions would compete in a duel. The side with the winning champion would win the dispute. In this case the correct summary statistic might be the strength of the strongest member of the group. “The Jan. 1593 single combat, using war elephants, between Siamese King Naresuan and the Burmese crown prince Crown Prince Minchit Sra – still celebrated in Thai history (statue in Samut Prakan Province, Thailand)” (http://en.wikipedia.org/wiki/Single_combat). The other rather nebulous concern is that CA is somehow flawed, and that kin selection is a better choice. I will have much more to say about this, but suffice it to say that I have addressed this issue in a recent Evolution article (Goodnight 2013. Evolution 67:1539-1548). Contextual analysis and the direct fitness approach to kin selection are based on the same equation. In this respect they are both either flawed or not flawed. The difference between contextual analysis (and multilevel selection in general) and direct fitness (and kin selection in general) is that contextual analysis measures the strength of selection at a given point in time, whereas kin selection identifies the optimum. You will almost never see multilevel selection identifying an optimum (the exception are studies of stabilizing selection), and you never see a measure of the strength of kin selection. They do not exist, they never have, and they never will. This entry was posted on Friday, July 19th, 2013 at 9:43 am and is filed under Uncategorized. You can follow any responses to this entry through the RSS 2.0 feed. You can leave a response, or trackback from your own site.